The season series was lopsided, but the end-of-season records were near identical. The Jets and Blues finished the campaign deadlocked at 99 points, with Winnipeg earning home-ice advantage by way of a tiebreaker. How much can one believe the results of a season series? That will be put to the test in the first round when the Winnipeg Jets square off against the St. Louis Blues. During the regular season, the Jets were dominant in their four meetings with the Blues, winning the first three games by a combined score by 18-9. The lone game St. Louis won was a 1-0 defeat of Winnipeg in early December. But here’s the thing: two of the Jets’ three wins came before the Blues made their coaching change, which was transformative for their season, while the third win came only days into Craig Berube’s tenure as bench boss in St. Louis. Once Berube was settled into his post, the Blues stifled the Jets’ attack and picked up their lone victory, a shutout, on Dec. 7. And beginning with that game, St. Louis has performed significantly better than Winnipeg, the Blues picking up 77 points and finishing 21 games over .500 across the past four months. The Jets were eight games above .500 with 63 points over the same span. The Central Division is going to be a knock-down, drag-out battle, and that begins with what is certain to be a contentious fight between two teams that finished dead-even in points this season. Winnipeg is built to play in all situations against any style of opponent. The Jets boast big-time skill and star power at forward with Mark Scheifele, Blake Wheeler, Patrik Laine, Nikolaj Ehlers and Kyle Connor. While they don’t have the deepest defense corps in the world, they can ice some combination of Jacob Trouba, Dustin Byfuglien and Josh Morrissey for half of every game. And in 2018 Vezina Trophy runner-up Connor Hellebuyck, they have one of the sport’s best young goaltenders. The Jets can keep pace with any team in the speed and finesse department and have one of the NHL’s top power plays, but they’re unique in that they can grind in the mud, too. If the officials pocket their whistles, that’s no problem for the punishing Byfuglien and Trouba on defense, and the Jets’ bottom-six includes an enviable mix of size, scoring touch and nastiness. Towering Kevin Hayes can kill penalties and pose matchup problems with his speed, while energetic Brandon Tanev can shift momentum with thundering hits. And whereas experience was at a premium a year ago, the Jets reached the Western final, and almost every member of that team returns for the 2019 post-season. Loaded as they are, the Jets aren’t as dominant as they were last season. They allow more shots than they generate, and they’re a below-average possession team, especially when it comes to high-danger shot attempts. They surrendered the third-fewest high-danger attempts at 5-on-5 last season compared to the 15th-fewest in 2018-19. That might explain why Hellebuyck’s numbers regressed this year. He faces 32.3 shots per 60 minutes, up from 31 last season. If Winnipeg doesn’t tighten up defensively, it’ll have to win a bunch of 5-4 games in the post-season. Morrissey is expected to return from an upper-body injury in time for Round 1, but it’ll be close, and he could be rusty. X-Factor: Adjusted for era, Patrik Laine was the most prolific teenage goal-scorer in NHL history, and he’s still just 20. But Laine has struggled this season with slumps and, in turn, his confidence. He went 15 games without a goal in and scored just twice in a 28-game stretch. Yet Laine also scored 18 goals in a 12-game span in November, including five times in one game (the first player to net five since 2011). When he’s feeling it, he’s the most unstoppable sniping force on the planet. While this season has been a disappointment for him, the right hot streak at the right juncture could make Laine the post-season’s most important player. People said “seller” in the same sentence as “St. Louis Blues” just a couple months ago, but a team that made so many summer upgrades finally realized its potential with a sizzling second half. Most prognosticators were bullish in October after the Blues radically overhauled their forward corps, and new No. 1 center Ryan O’Reilly has been a revelation, playing the best offensive hockey of his career while still dominating on faceoffs, killing penalties and battling the opposition’s best forwards. David Perron’s third tour with the Blues is his best yet. He and O’Reilly took a lot of pressure off Vladimir Tarasenko, Brayden Schenn and Jaden Schwartz. The “one-line-team” identity that plagued St. Louis the past couple years didn’t ring true anymore. Even young center Robert Thomas started to blossom down the stretch. St. Louis remains a defense-first team under coach Craig Berube, who took over from Mike Yeo in November. Built around sturdy blueliners Alex Pietrangelo and Colton Parayko, the Blues are a top-three team in shot suppression. The key to getting rewarded for their play was having a goalie who turned aside the few shots that did get through, and it’s no secret rookie Jordan Binnington was St. Louis’ best player from the moment the calendar hit January. This team isn’t in the hunt without his unbelievable second-half play. The Blues went from underachiever to overachiever in a matter of weeks – but where does that leave them relative to their Central Division rivals? They can’t match the star power of Winnipeg or the stinginess of Nashville. St. Louis’ hot streak suggested it could hang with anyone in the West, but what if it was just that – a hot streak? 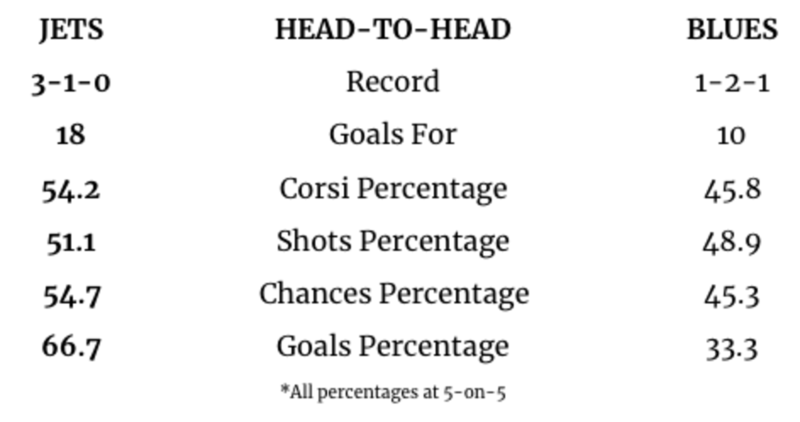 Even with their forward upgrades, the Blues can’t roll out scoring threats on line after line the way the Western Conference’s other top dogs can. It’s more likely St. Louis will have to win ugly. X-Factor: Jake Allen was arguably hockey’s least consistent goaltender the past few seasons, leaving the starter door open for 25-year-old Jordan Binnington. He vaulted into the Calder Trophy discussion by finishing with a 24-5-1 record, five shutouts, a .927 SP and league-best 1.89 GAA. He epitomizes the idea of a playoff X-factor. On one hand, he’s shown the ability to steal games, meaning he could key a St. Louis upset. On the other hand, he’s completely untested under playoff pressure. As he goes, the Blues go. They’re a team built to win low-scoring games, not end-to-end shootouts. THN Series Pick: Winnipeg Jets in six.